About 610,000 people in the United States die from heart disease every year. With a treadmill stress test and proper preventive care and treatment from Dr. Keven Tagdiri, you can decrease your risk of complications from heart disease. Thorough testing and treatment for heart disease are available in Encinitas, California, where Dr. Tagdiri has provided compassionate medical care since 1991. Call Keven Tagdiri, MD, or schedule a visit online for a treadmill stress test and heart disease screening today. A treadmill stress test — also called an exercise stress test or stress echo — uses an echocardiogram (echo) to measure the function of your heart. Dr. Tagdiri performs a treadmill stress test if he suspects you have cardiovascular disease or another heart-related health problem. For your treadmill stress test, you begin walking on a treadmill at a low speed. As the treadmill increases in speed, your heart naturally works harder to pump blood to your muscles. Dr. Tagdiri monitors your blood pressure and heart rhythm while you’re exercising and assesses any abnormalities he finds. Once your heart rate reaches its peak level, you stop walking on the treadmill and Dr. Tagdiri performs your echo — a type of ultrasound image of your heart. These images show the amount of blood and oxygen your heart muscles are getting during exercise. If Dr. Tagdiri sees a decrease in blood flow or a lack of oxygen to your heart muscles during the test, he diagnoses you with heart disease. An echo may be performed if Dr. Tagdiri suspects you have heart disease or if you’re already following a cardiac treatment plan. This test is repeated as necessary to ensure your heart is functioning properly, and if not, to adapt your treatment plan as needed. Heart disease — also called cardiovascular disease — is a chronic condition that affects your heart and blood vessels. It can cause other heart-related health problems related to atherosclerosis. Atherosclerosis occurs when cholesterol builds up along the lining of the walls of your blood vessels — including those in your heart — and causes the blood vessels to harden. Heart disease is known as a silent killer, often because there are no symptoms. However, it can be extremely dangerous and may lead to a heart attack, stroke, or even death. 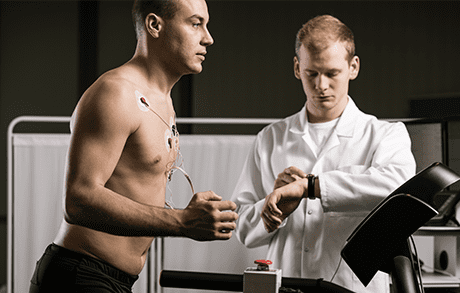 A treadmill stress test is an important assessment for your heart health. To schedule a visit, call or use the online portal to set up a visit with Keven Tagdiri, MD.